PT Telkom Akses - PTTA or referred to as "Telkom Akses" is a rapid growing information technology (IT) company in Indonesia with core business in the field of construction, services and trade in the field of telecommunication. Its business include broadband network installation, network terminal tquipment (NTE), and operation & maintenance (O&M). 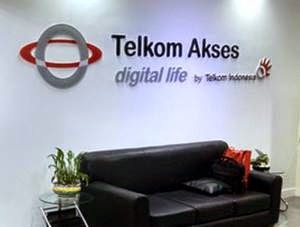 Telkom Akses is a direct-subsidiary company of state-owned telecommunication giant PT Telekomunikasi Indonesia Tbk (Telkom Group). Telkom Akses is wholly-owned by Telkom Group. Telkom Akses was incorporated on 26 November 2012 and commercially operate on February 2013. Telkom Akses is based in Jakarta and now has 5 regional areas, comprise of regional area Sumatera, regional area Jakarta - Banten, regional area West Java - Central Java, regional area East Java - Bali - Mataram - Kupang and regional area Kalimantan - Sulawei - Maluku - Papua. Telkom Akses has also shown positive financial performance in 2015. According to Telkom Group Annual Report 2015 as cited by JobsCDC.com, Telkom Akses booked total assets of Rp 3,696 billion in 2015. This reflected an 76.92% increase from Rp 2,089 billion in 2014. Minimum S1/S2 in Economics, Computer Engineering, Telecommunication Engineering, Finance, Accounting, Banking, Business Studies, Administration, Management or equivalent. Required experience for minimum 1 year in the related field, preferably staff specializing in Marketing/Business Development or equivalent. Minimum S1/S2 in Industrial Engineering, Human Resource Management, Psychology or equivalent. Required experience for minimum 1 year in the related field, preferably staff specializing in Human Resource or equivalent. Previous experience in HR analysis. Previous experience in workforce planning process. Able to perform data processing with either. Strong knowledge and good understanding about HC Plan. Minimum S3 in Economics, Finance, Accounting, Banking, Business Studies, Administration, Management or equivalent. Required experience for minimum 6 years in the related field, preferably Assistant Manager/Manager specializing in Marketing/Business Development or equivalent. Have experience and expertise in designing a business. Have experience and expertise in analyzing future business. Minimum S1/S2 in Marketing or equivalent. Required experience for minimum 5 years in the related field, preferably Assistant Manager/Manager specializing in Marketing/Business Development or equivalent. Strong negotiation and public speaking skills. Regional Sumatera : Aceh, Medan, Pematang Siantar, Pekanbaru, Batam, Padang, Palembang, Pangkal Pinang, Jambi, Bengkulu, Lampung. Regional Jabar : Sukabumi, Bandung, Cirebon, Karawang and Tasikmalaya. Regional Jatim : Surabaya, Sidoarjo, Malang, Kediri, Jember, Gresik, Pasuruan and Madiun. Regional Balinusa : Denpasar, Singaraja, Mataram and Kupang. Regional KTI : Makassar, Manado, Palu, Kendari, Pare-Pare, Ambon, Jayapura and Sorong. JobsCDC.com now available on android device. Download now on Google Play here. Please be aware of recruitment fraud. The entire stage of this selection process is free of charge. PT Telkom Akses - Recruitment S1, S2, S3 Staff, Manager Telkom Group June 2016 will never ask for fees or upfront payments for any purposes during the recruitment process such as transportation and accommodation.